The X-1 program wasn’t just about reaching Mach 1. Supersonic was only one of numerous areas of flight and flying that the craft explored. The X-1’s speed was achieved by the thrust of a Reaction Motors XLR11 rocket (more of which later), and the duration of the flight was limited by the motor’s fuel. The first X-1s were fueled for a around 5 minutes powered flight, afterwards the aircraft was a glider. This was part of the reason the aircraft was launched from a B-29 before the motor was ignited, they wanted the X-1 at an altitude where the motor and aircraft were going to be at their most efficient before expending fuel. The US Navy was also experimenting with high speed aircraft, in their case the Douglas D-558-1 Skystreak. Notice the Navy team are more shy that the Air Force’s similarly posed X-1 team! The rivalry between the Navy and Air Force was as intense as ever, with the Navy laying claim to having the only true supersonic “aircraft” because the Sykstreak took off from a runway. The Navy aircraft had reached that milestone only once, but it was more than the Air Force could stand, so over Christmas 1948 they devised a plan to ground launch the X-1. On 5 January 1949, Yeager lit all four rocket chambers, and accelerated to 200mph in just 1500ft. When he pulled the nose up the plane leapt into the air. He immediately brought up the undercarriage (reduces drag), but the forces were already so great that the actuating rod snapped and the flaps were torn off. Undeterred, he put the aircraft into a steep climb and in 80 seconds reached 23,000ft and Mach 1.03, setting a time to altitude record for the 20,000ft mark on the way. The Navy must have been ticked. In the time it takes to read this post, Yeager had traveled vertically by more than 4 miles. To put that in perspective, the typical WW2 Mustang, Spitfire or P-38 (which were all in service at the time) would have taken around 5 minutes to achieve that altitude, and been drastically slower when they got there. The Air Force must have been salivating at the possibilities for aerial interception. 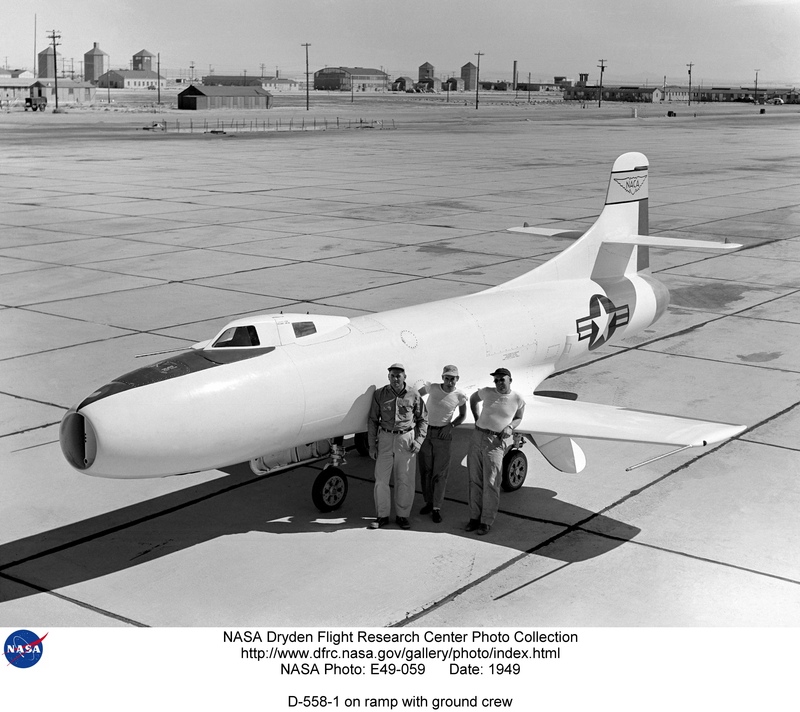 In parallel with the X-1 program, NACA began a second study using the Douglas Skyrocket, their intention: to break Mach 2. 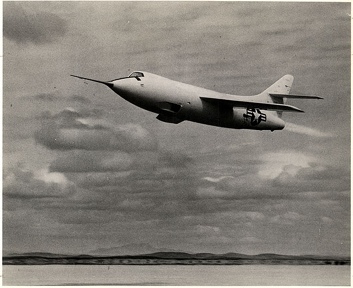 Scott Crossfield achieved that record on 20 November 1953, Mach 2.005 in a dive. A little competition is always a good thing for progress, and after Yeager broke the sound barrier, the Air Force ordered further aircraft, X-1A thru E. Each of these aircraft was designed to address a particular aspect of expanding the operational envelope of supersonic flight. Out-doing the Navy wouldn’t harm either. X-1A was larger and heavier than the original aircraft but achieved further speed and altitude records. In December 1953, less than one month after Crossfield’s record was set, Yeager achieved Mach 2.44 (1,620 mph), this time in level flight. In six years, Bell, NACA, the Navy and the Air Force had pushed aircraft from subsonic to over twice the speed of sound. An amazing achievement. In other words he would have ejected if he could. Given the speeds and aggressively changing accelerations, it’s debatable whether he would have survived ejection. I’m sure he realized this and it speaks clearly to how rough the ride was, and how calm he kept. After Yeager’s incident, the X-1’s were no longer pushed for higher speeds, but X-1A had one more record up its sleeve. 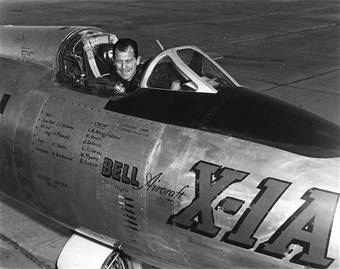 On 28 May 1954, Arthur “Kit” Murray piloted the X-1A to a record 90,440ft. 17 miles, straight up, in an airplane. Murray went on to manage the X-15 program and sadly passed away recently. The X-1B was covered with thermal probes to investigate heating effects and completed 27 flights. This aircraft was also the first to use small rockets for direction control, experience later used on the X-15 and every US rocket program. X-1C was intended to test weapon systems, but with supersonic capable aircraft like the F-86 Sabre and F-100 Super Sabre coming into service it was overtaken by events and cancelled before construction. The X-1D was a second generation of the X-1 that used a low pressure fuel system intended to improve reliability, safety and operational life. In the event, the X-1D flew only a single un-powered flight. 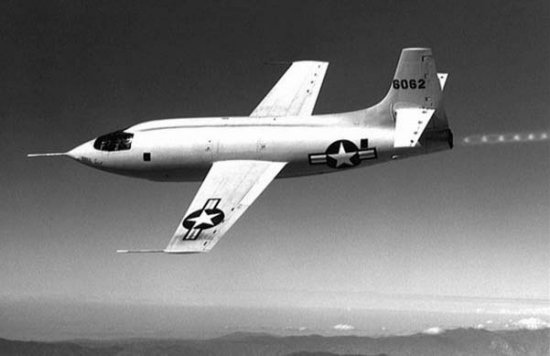 The X-1E was created from the X-1-2 as a replacement for the X-1D. It used thinner wings, a “knife edge” windscreen and was covered with pressure ports and strain gauges to record aerodynamic data and structural loads. USAF pilot Joe Walker reached Mach 2.21 in 1958 before NACA pilot John McKay took over in an attempt to reach Mach 3. The aircraft was grounded due to cracks in the fuel system before this milestone was reached. X-1-3 was lost in 1951 while being de-fueled, destroying its B-50 mothership and seriously burning pilot Joseph Cannon. X-1D was lost in 1951 while being prepared for its first powered flight. X-1A was lost in 1955 while being prepared for launch from its RB-50 mothership. These accidents took two lives, injured numerous ground crew and destroyed several aircraft. The cause of the explosions was eventually traced to tricresyl phosphate (TCP), a leather treatment used in the liquid oxygen fuel system. The substance was found to decompose violently when exposed to cold and mechanical shock. Given that these ingredients were on every X-1, it’s amazing that there weren’t more accidents. It was one of many material science discoveries that lead to better and safer aircraft, both sub and supersonic. Wow. Reading the transcript was thrilling. Reading about it is about as daring as I want to get in any aircraft. Yeager set a great standard for the test program. Yes, what he doesn’t say, says as much as what he does say. There’s no panic, just an objective commentary. Glad you enjoyed it. Wow, indeed. Those days were ones of head-spinning advances in aeronautical engineering–and this was before computer modeling. You know what’s sad? Think of all the names that have disappeared. Not the pilots, but the companies that designed and built aircraft in America. Because of the interleaving of industry and government, both design and commercial success have often been sacrificed. How many manufacturers are left? Bell, Boeing, Northrup, Sikorsky? That’s about it. The government keeps allowing companies to merge, ensuring diminished competition. It’s a shame. If we still had that old-style attitude, not just from guys like Yeager, but from the industry itself, wow–can you imagine? You make a very good point, Texanne. For a country of capitalists we’ve gone a long way down the path of eliminating competition for short term gain. Without delving into too much politics, I think people in government have colluded with industry’s ideas for selfish reasons. I saw a diagram showing defense company mergers once, I’ll see if can find it, might be worth highlighting.